In Griechenland supporte ich Aktivisten an der Grenze. Die Erfahrungen und Begegnungen die ich da mache nehme ich mit zurück in die Niederlande mit diesem Dokumentarfilm. Warum nicht über inspirierenden Aktivismus reden? An der Grenze werden fortwährend Menschenrechte missachtet. Lasst uns nicht zulassen, es still darum werden zu lassen! Die Motivation für dieses Projekt ist selbst aktiv werden zu wollen. Ich will nicht weggucken, ich will mich konfrontieren. Einerseits bin ich geschockt von der menschenunwürdigen und diskriminierenden Grenzkontrolle und den Lagern wo auf Lesvos Menschen eingesperrt werden. Andererseits höre ich auch von Aktivisten und Inselbewohnern, die genau da hin gehen wo's brennt. Sie setzen ihr Privileg sich frei bewegen zu können ein, um für Menschen auf der Flucht da zu sein. Darum geht es hier: von diesen Leuten erzählen, um über die Umstände zu informieren und gleichzeitig Hoffnung und Inspiration ins nördliche Europa reisen zu lassen. Denn wir können überall aktiv werden. Postcards strives to inform, raise awareness and lead to activism. It aims at making young people engage with inhumane conditions at Europe's borders. It builds communities to counteract racism and an apathetic state fuelled by the negativity and channeled nature of information on main stream media. It empowers young people to carry the hope and responsibility for change and a critical worldview. Firstly, the movie raises awareness. It addresses inhumane conditions as a result of Fort Europe. It criticizes those circumstances, as can be seen in Greece as a detention center for people on the move. It confronts viewers and participants with Europe's blind spot when it comes to human rights. It raises awareness for the de-humanization of people. Secondly, it serves as a report from the border. It informs and archives stories and facts for collective memory. Thirdly, this project promotes curiosity, activism and taking critical standpoints. The movie making process lives of these principles: I will constantly reflect and strive for being active and alert. I will actively engage with who we meet and invite for participation. Forth and lastly, Postcards gives hope, because it shows ways to action, builds community and connects people. At the return in Nijmegen the documentary will be guerilla- and open air screened in the public space. This will be in the summer, around July and August. What is better than watching a movie out in the open on warm summer days? This is where you will see this movie. The public space is where it belongs, in order to reach as many people as possible and as openly as possible. In Nijmegen, I was active with a group of friends in a direct action solidarity group called justPeople. 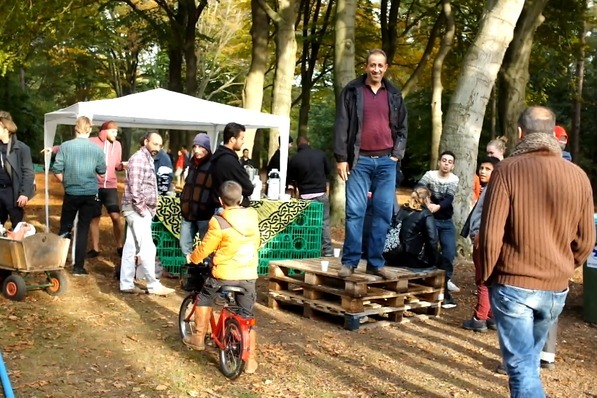 When the emergency refugee camp in Heumensoord still existed, we went there, offering coffee, tea and legal information. We found friendships that last until now. This experience makes me believe in direct action, solidarity, confrontation and reflection. This creates community, shows alternatives and hope! Critical information and inspiring examples are important, because another world is possible, we have to show it! Your support is crucial! Yes, there is the financial part about it. With your support I will be able to buy a camera and some equipment like a microphone, additional batteries and SD-cards. But it means more to me: I'd love the idea of you coming with me. Because communities make us stronger, they give us input and allow us to learn. In my case, I know that this trip will also be challenging. It is one thing to read about the fate of people and it is another thing to actually be there. Laura is a documentary filmmaker and activist. Since her MA thesis in Anthropology, she is particularly interested in the public space. She researched how neighbourhood engagement translated into the public space in Santiago de Chile. She has been a part of the Klinker collective, justPeople and Filmcafé Onderbelicht for several years. 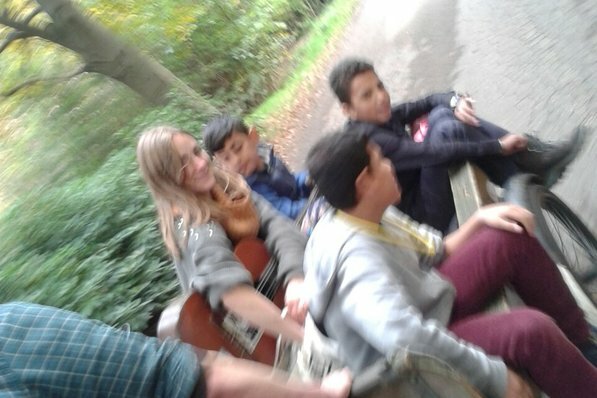 Recently she co-founded a radical language school in Nijmegen. Thank you everyone who has supported up to now! It's absolutely incredible this crowd funding experience. Your quick support encourages me, to raise the funding goal from 1500€ to 2000€. Then, if we reach 1500€, the project is considered successful. The extra money towards 2000€ will help for the travel costs. We will be 2 or 3 people driving together. The cost for ferry and the car will be around 600 € minimum. Merci, bedankt, thanks, danke, shukran..! Let me invite you exclusively to the premiere. With this invite you'll also get a link to the movie to remote-celebrate! Thanks a lot for your support and interest! It means a lot. As a sign of gratitude this reward is a modern postcard aka an E-card designed by me, which you will receive exclusively from Greece. You will also be named in the credits if you want to. Thank you! This reward is an exclusive and hand written postcard from the Europe's border! You will be named in a special thanks-to section support section in the credits of the movie. You will also get the inclusive invitation to the premiere and the link to the movie. Great! Next to the other the invitation and the special supporter metion, you will receive a personal greeting-video from Greece! I will shoot your CV video with a maximum length of 2 minutes.